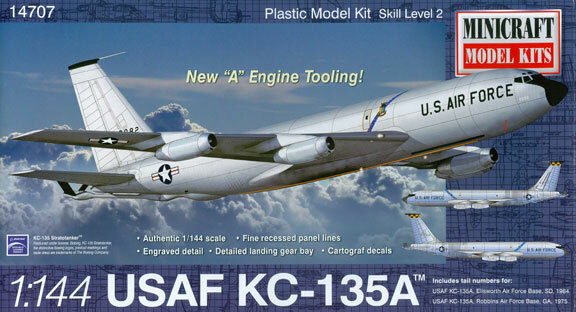 The long anticipated Boeing KC-135A Stratotanker kit has been released by Minicraft as kit M14707. This release completes their series of KC-135 kits which includes the JT3D powered KC-135E (M14627 ) and CFM 56 powered KC-135R (M14708). This kit comes with the Pratt & Whitney J-57-P-59W turbojet engines, as fitted to all the KC-135A’s when they were first delivered. Markings are provided for two USAF aircraft. This entry was posted in KC-135, Minicraft, New Kits and tagged KC-135, Minicraft. Bookmark the permalink.